A number of social platforms are coming up on the internet these days. The users generally love a network where they can interact with the like-minded people and enjoy talking to each other. The chat feature is one of the most important features that make communication possible. To create an engaged community of users, private communication is really important. But, building the chat feature from level zero might be a daunting task as you have to code a lot of features that must be added in a chat. The software – Cometchat solves this problem and adds seamless feature to your website and the mobile app. Let us explore about it in details. Cometchat is one of the top-rated PHP chat software which helps your website/app users to interact with each other with utmost ease. The users on your website/app will be able to do just anything they can do on apps like Google Hangouts or Whatsapp. It provides you with an ability to add chat, broadcast messages, voice chat, video conferencing, sending media, and many more features to your website/app. Cometchat is integrated with loads of features. Let us go through the list of some of the most overwhelming features of this software. Full-Fledged Messaging App: It works as a fully fledged messaging app for every user. You can find all the desired features along with a few additional features required to interact and communicate. Moreover, the users can broadcast the messages to unlimited users. Group Chats/Video Conferences: Cometchat comes with an ability to let your users chat in groups, very similar to other popular messaging apps. You can improve your communication with the peers through video conferencing. Play Games: Though it is an additional feature, it keeps all your users engaged within your website/app. Cometchat offers a plethora of games that can be played by the users when they are getting bored. The games are built using HTML 5 and come up with complete browser support. It is one of the added advantages of getting this software integrated to your website/app. Completely Secure: Its chat mechanism is totally secure which ensures complete privacy of the users communicating using this platform. The group chats too can be protected with the password to add an extra layer of security. It promises a high-level of security is maintained. Chat Bots: The chat bots have become really popular these days. The Cometchat software has some chat bots which can help you in many different ways to bring out the best. The user is allowed to ask the question to the bot in between the chat without leaving the conversation. Multiple Platforms: This software is available for nearly all the platforms in which your network or services exist. You can easily use it on the web. Moreover, it has its client for the desktop and the mobile app as well. The app is available for both iOS and Android. Not only this, you can get the mobile chat SDK from its website to develop your own iOS/Android application. Huge Plugin Library: A number of plugins along with the add-ons are available to integrate the Cometchat software with your original product. Moreover, these add-ons and plugins offer even more features that actually exist in the software. The integration of these plugins is really easy with Cometchat. 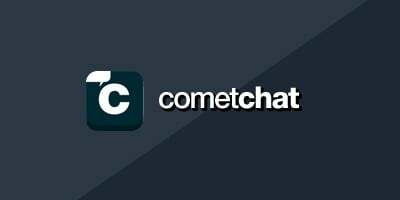 Why you should use Cometchat? Cometchat is integrated with loads of features. Not the least, these features can be thoroughly enjoyed at really affordable price. If you are looking for chat software then Cometchat is one of the best software you should look at. It runs on different platforms and the users can use it on their website/app. A number of Cometchat reviews have been positive so far and its clients have given it a positive rating. If you need the chat feature on your website then you should trust Cometchat for the same. The different plans can be availed according to your needs. One of the best things about this software is that it comes with onetime fee. You need not pay on monthly or yearly basis. Once you have purchased it from its website, you can use it seamlessly over the years. It offers three plans to the users starting from $129. The highest plan is priced at $499. Over 30000 customers are using this software and more and more are getting connected to it. You can try this software now and use it endlessly on your website/app. 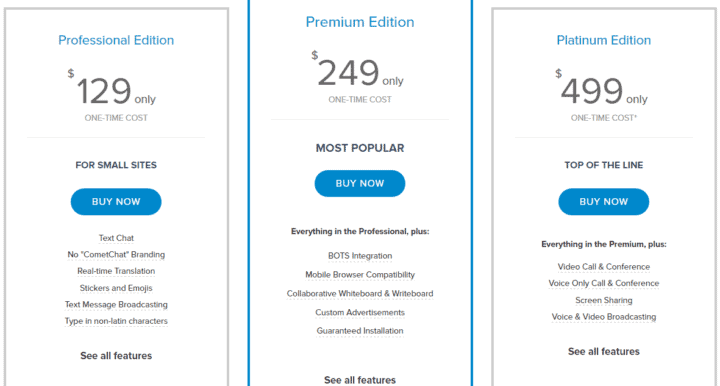 You need to pay extra amount to buy the add-ons or plugins. As we all know that 4th of July (The Independence Day of the USA) is near, Cometchat is offering exclusive discounts on its products, upgrades, and renewals of the existing products. Moreover, the users can get the exclusive 4th of July stickers from here. If you wish to save your hard earned money, it’s the time now to make use of this Independence Day sale on Cometchat’s website. Thunderous and raging discounts are available on your purchase. Moreover, it is offering a complete package to the user to use its products on different websites and apps. Check out this sale and take full advantage of it. If you are looking for the PHP chat integration, Cometchat is one of the best options you should go to. It is ideal software that can help you integrate the complete chatting platform to your website/app. Moreover, you can purchase the SDK and make your own app for iOS/Android. Moreover, it works on different platforms and has plugins or Add-ons to integrate Cometchat software to a website easily. Cometchat will help your website/app users to communicate to each other through different means whether it is text messaging, voice calling, or video conferencing. Just integrate this software to your site/app and help your users to interact with each other.